A few weeks ago, I was at one of my favorite Thai restaurants and had vegetables with a "tropical" sweet and sour sauce - a sweet and sour sauce containing pineapple juice and chunks. This weekend, I took my favorite sweet and sour sauce recipe and threw in some canned pineapple juice and chunks. It tasted pretty much like the restaurant version I had. To add protein to this tropical sweet and sour dish, I made crispy seitan. I've made crispy seitan before. 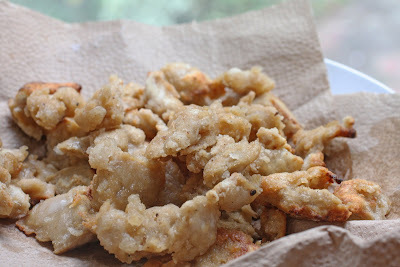 Normally, I just toss seitan strips in cornstarch and then fry them in a pan with a 1/4-inch of canola oil. This time, though, I dipped the seitan strips in Ener-g Egg Replacer (approximately 3 tablespoons water mixed with 1 tablespoon egg replacer) and then tossed the strips in cornstarch before frying them. The seitan strips came out of the pan with a really nice crispy coating. I can't wait to try this with tofu! 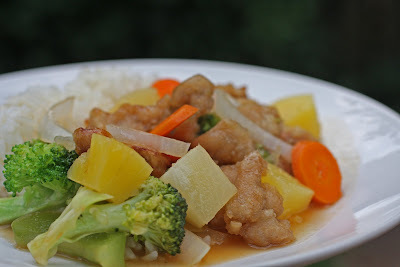 The following dish is for sweet and sour seitan and vegetables, as shown in the photo above. If you don't want the "tropical" version of this sweet-and-sour sauce, just omit the pineapple juice and chunks. Make the crispy seitan strips in the manner described above. Set the seitan aside. In a small saucepan, combine all of the sauce ingredients, except for the cornstarch, and gradually bring to a simmer. Heat the oil over medium heat in a wok or large skillet. Add the onions, carrots, and bell peppers and cook until the onions start to become soft, about 3-5 minutes. Add the broccoli, along with 1/2 cup of water. Bring to a boil and let the broccoli steam in the uncovered wok or skillet. In a small bowl, mix 2 teaspoons of the cornstarch with approximately 1 tablespoon of cold water. (If you want a thicker sauce, mix 1 tablespoon of cornstarch with approximately 1 1/2 tablespoons of cold water.) Stir this cornstarch-water mixture into the small sauce pan. When the water in the wok or skillet has evaporated, add the contents from the saucepan to the wok or skillet, along with the pineapple chunks and crispy seitan. Stir until the vegetables and seitan are coated with the sweet and sour sauce and serve. That looks fantastic and like something I would adore!